First of all, Buzzbird is a free and open source software. Buzzbird have everything one would ever expect from a Twitter desktop client, well almost. There are no theming options or extension support for now which is a huge letdown. But they are on their way according to the developers. Shortcut keys are good and extremely useful. Simple configuration menu which makes 'configuring' easy. Buzzbird is multi-platform(support for Windows, Mac and Linux) and supports multi-account. How to Install Buzzbird in Ubuntu/Linux? Download latest Buzzbird from here. Unzip the downloaded tarball. Goto the folder and simply click on the file named 'Buzzbird'. 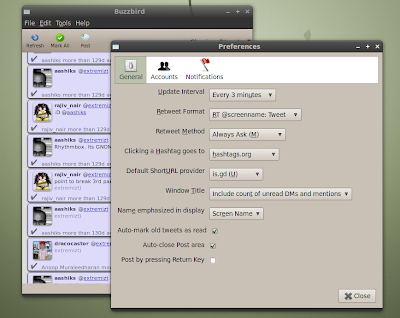 There you have it, the latest Buzzbird twitter client for Linux. Now, it is not optimal to launch buzzbird from a folder everytime you want to access it. Lets go create a menu item for Buzzbird then. 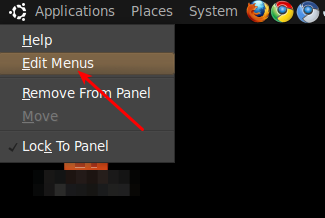 How to create a menu item for Buzzbird in Ubuntu/Gnome? Right click on the main menu (top left) and select Edit Menus. Then select Internet from the left pane and choose New Item(like in the screenshot below). 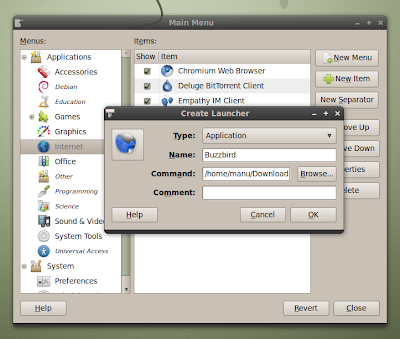 In the command field, browse to the buzzbird folder that you have previously downloaded and select 'buzzbird' launcher. Like I have done here, you may also include a Buzzbird icon. Chromed Bird Twitter Extension for Google Chrome is Awesome. Twidge Twitter Client is for Those Who Terminal-ly Hate GUI.